Consumer demand for organic foods is partially driven by perceptions that they are more nutritious. Now a peer-reviewed study just published in the British Journal of Nutrition , a leading international journal of nutritional science, has shown that organic crops and crop-based foods are between 18 to 69 percent higher in a number of key antioxidants such as polyphenolics than conventionally-grown crops. Numerous studies have linked antioxidants to a reduced risk of chronic diseases, including cardiovascular and neurodegenerative diseases and certain cancers. The research team concluded that a switch to eating organic fruit, vegetable and cereals – and food made from them – would provide additional antioxidants equivalent to eating between one and two extra portions of fruit and vegetables a day. Moreover, significantly lower levels of a range of toxic heavy metals were found in organic crops. For instance, cadmium is one of only three metal contaminants, along with lead and mercury, for which the European Commission has set maximum permitted contamination levels in food. It was found to be almost 50 percent lower in organic crops. Nitrogen concentrations were also found to be significantly lower in organic crops. Concentrations of total nitrogen were 10 percent, nitrate 30 percent and nitrite 87 percent lower in organic compared to conventional crops. The study also found that pesticide residues were four times more likely to be found in conventional crops than organic ones. The study is the biggest of its kind ever undertaken. 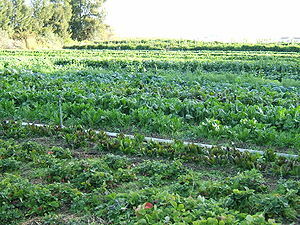 The international team of experts led by Newcastle University in the UK analysed 343 studies into the compositional differences between organic and conventional crops. New methods were used to analyse the data. The findings are based on the most extensive analysis of the nutrient content in organic vs conventionally-produced foods ever undertaken and result from a groundbreaking new systematic literature review and meta-analysis by the international team. The entire database generated and used for this analysis is freely available to the public . There has been for a long time serious concerns about the health impacts of eating food that has been contaminated with petro-chemical pesticides and fertilisers. Over the past 60 years, agriculture has changed more than it did during the previous 12,000. And much of that change has come about due to the so-called ‘green revolution’, which has entailed soaking crops with chemicals. Coinciding with these changes has been the onset and proliferation of numerous diseases and allergies. There are numerous studies that point to strong associations between chemical pesticides and serious health consequences, including endocrine disruption and fertility problems, birth defects, brain tumours and various types of cancer . A few years ago, a Canadian parliamentary committee heard testimony from 85 witnesses and analysed over 50 briefs, which produced a frightening overview on the effects of pesticides and their pervasiveness in the environment . Evidence also demonstrates a potentially dangerous link between many pesticides and naturally occurring substances. For example, a British study done way back in the 1970s and reported in the journal ‘Nature’ indicated that the insecticide carbaryl can combine with nitrites from food additives in the stomach and create a carcinogenic and highly mutagenic substance. Moreover, petro-chemical agriculture appears to result in today’s food having less nutritional value . The new study shows without doubt there are composition differences between organic and conventional crops. Professor Leifert rightly says there is an urgent need to carry out well-controlled human dietary intervention and cohort studies specifically designed to identify and quantify the health impacts of switching to organic food.